One of the absolute best medium-size shrubs for residential landscape use, dwarf burning bush is currently out-sparkling just about everything in the late fall, northern landscape. They don’t call it burning bush (and it didn’t capture Moses’s attention) for nothing. ‘Compactus’ is, as the name implies, a more compact, denser variety of E. alatus than the classic winged euonymus. It grows quickly to eight to ten feet in height with a natural width of six to eight feet. Somewhat shorter in shade. Width is easily controlled by base pruning. Corky branch texture is intriguing. 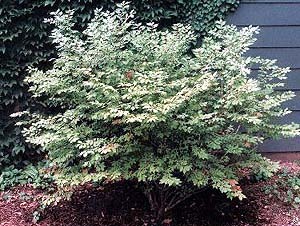 Relatively small, attractive leaves of a soothing light green provide great summer interest, as the does the dense, vertical-to-horizontal branching habit. ‘Compactus’ always looks like a plant in motion. 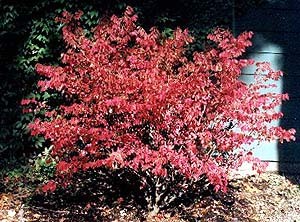 But it is the blazing, pinkish-red fall color (when the plant is grown in at least five hours of direct, midday sun) that makes this shrub such a treat. ‘Compactus’ is easy to grow and quite disease/pest resistant. It’s an excellent specimen plant, meaning you should place it where all or most of the plant is visible in the garden. It tolerates a wide range of soil types, and will grow in everything except the dampest soils. It will do fine in medium shade, but as mentioned above, good daytime sun is needed if you want to see fireworks in the fall. Whether planted near the foundation of the house, or further out in the landscape, it will soon become one of your favorite deciduous shrubs.